Having just listened to Melvyn Bragg‘s In Our Time (In Our Time, 29th March 2012: The Measurement of Time) – discussing the history of the measurement of time, appropriately enough – here I am posting about the ultimate time-devouring black hole, an evening waiting in A&E. It was nothing major, just a bad wrench of my knee playing football, so I needed to get some crutches. A&E is one of the few places, apart from through qual research work (sometimes), where you can see a cross-section of society thrown together. Also good for this are zoos and swimming pools; and some public parks, but it depends on the catchment area. In Oxford, where I live, it’s South Park (the big one going up Headington Hill) yes, University Parks no. Any of these are more fun than a night at A&E. But an interesting snapshot all the same. Maybe snapshot isn’t the right word. It was about as snappy as watching Geoff Boycott and Chris Tavaré opening the batting at Edgbaston through a vat of treacle. (For non-cricket-fans, Tavaré was an England batsman in the early 80s who was very hard to get out but showed virtually no interest in actually scoring runs. He was frequently depicted by cartoonists as a tree, with roots reaching deep into the earth below the crease. Boycott, for all his many serious faults, is a national institution. He did much the same thing, only better, and with his mouth hanging down at one side). Waiting time on Monday night was five and a half hours. An electronic board flashed up a four hour waiting time as soon as we walked in; by the time I left, it was flashing six hours. Mobiles are not allowed of course, so I had plenty of time to flit discontentedly between my badly translated 1950s Mexican novel and a Bill Bryson tome on spelling and grammar. There was a coffee machine. At five hours and twenty five minutes of waiting (by now 12.40am, having arrived at 7.15pm) I snapped. I hobbled up to order a coffee, in my bleariness taking several minutes to negotiate a path through the non-intuitive vending interface. (Do these companies not consumer-test their contraptions?) No sooner had I taken my first sips than, you guessed it, my name was called and I had to abandon my hard-earned, steaming trophy. Definitely one of those nights. What made it worse was that I was supposed to be at a Stewart Lee gig at Oxford Playhouse I’d been looking forward to for months. 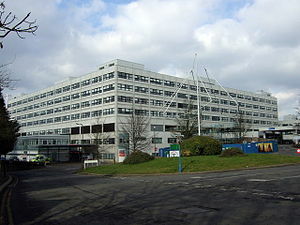 The John Radcliffe Hospital, Oxford, England (Photo credit: Wikipedia). Located in Oxford so that astro-physicists working on the curvature of space-time can study the remarkable black hole that has emerged in the A&E Department. a young black guy handcuffed to a policeman. Let’s put him as a D. Hard to see what was wrong with him, but presumably there had been some kind of a fracas and maybe he’d taken a couple of stern whacks from the Peelers that needed to be checked out. Seemed very chipper though, the most upbeat person there in fact. various 30-something blokes with football injuries (mix of B, C1, C2 and D). As a 40-something bloke with a football injury, I could only laugh at their callow inexperience before wondering why, 27 years after my first busted knee trip to hospital, I hadn’t learned my lesson. a man in his 20s walking around bleeding from the head, looking either drunk or concussed, or possibly both. The fact he was about to collapse didn’t seem to move him up the queue particularly. I’d have him as a C1. two very loud Americans behind me, probably mature students (Bs), who maintained high volume conversation for at least the first four hours. They struck me as the types more likely to support “Obamacare” than not; if so, I hope Monday night didn’t put them off. At least, I hope, they’re not the sort to go on the Rush Limbaugh show to talk about their experiences of Britain’s goddang commy NHS. a young girl of about 6 who had fallen off her rocking horse and broken her leg (B). I imagine it was a beautifully crafted rocking horse, sitting on a magnificently polished hard wooden floor. I can talk, my son broke his leg on our floor when he was one, somehow. lots of old people, by which I mean 75+. Nice to see all of them there with family or carers. Mainly C1C2D. 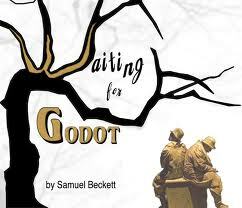 Life is a waiting room. Luckily, not this one. And much, much more. OK, so not quite all of human life. What amazed me was how patient people were. Perhaps they were all seething inwardly like me and just lacked the outlet to vent their frustration. But despite the stressfully massive waits, there was no angry shouting at the admin staff behind the window, not even much visible annoyance. The only exception was when a few of the admin staff shared a joke and we heard laughter coming from their little booth: several of us waiting exchanged snarls, though in retrospect this was unfair of us perhaps. Not to Melvyn brag about Ulster fortitude but I’ve managed ten in-home depth interviews since my disabling injury, in Wisbech (hobbling around without crutches – agony), Reading and South-West London (with crutches, embarrassing but fine). I did ask myself whether I would have just cried off had I not been self-employed. Answer: I would have lined up a substitute for at least one of the fieldwork days. Being on crutches for a few days – I’ve been on them for several weeks during previous football injuries – does give you a tiny insight into the difficulties of travelling that people with long term disabilities have to work around. I had to travel by Tube across London on crutches for several weeks in early 2000, when I was living in Finsbury Park and working in Richmond. I was amazed at how many people, even after noticing the crutches, were happy to barge past me; and how few people offered to give up their seats on the trains. Escalators were a nightmare – getting on an off – and when an escalator was broken, it was a complete disaster. The hardest thing with crutches, for a fumbling idiot like me, is carrying things and getting things in and out of your pockets. I had to make my way out of the flow of people into a quiet spot to put down crutches, balances, get out my tube pass (pre-Oyster days of course) and so on. Then get back into the flow again. By the time I got to work I was physically and mentally exhausted. They had a logo and everything. The big idea we had from the research was that all firms should have a Disabilities Champion – someone whose job it is to be aware of the needs of employees who have disabilities and also to make sure disabled applicants are given a fair crack at landing a job. In my old agency, in our office of around 200 staff or so, we had one disabled worker, and she lost her job when the financial crisis started. 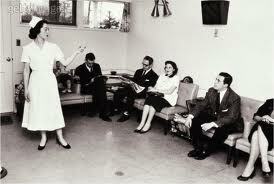 Asking around, hardly anyone knew she was disabled or had any idea of her life history (e.g. being abandoned as a baby due to her disability and raised by foster parents and in care homes) or had thought very much at all about how hard it was for her to get into work; or what it meant to her to be there. I’m not saying it was a particularly heartless place, quite the opposite a lot of the time. It was probably fairly typical of most workplaces, where disability issues were simply not on the radar. By the way, in my project, Marks and Spencer stood out as a really fantastic employer for disabled people. They couldn’t have been nicer to me or more supportive, from what I could see, to their disabled staff. Adding that to my Monday listening to people in some of Wisbech’s more deprived districts, I do count my lucky stars – a few days on the crutches really isn’t the end of world. This entry was posted in 21st Century Britain, Qual Research, Society and tagged AQR, class, Disability, ethnography, Health, qualitative research, Radio 4, society. Bookmark the permalink.